Development in the Sydney South West Growth Centre is generating increasing traffic flows in the region. Roads and Maritime Services are implementing an extensive upgrade of the road network to provide the capacity needed to meet the projected demand generated by the urban development. Bringelly Road forms a key component of the regional road network and is therefore being upgraded by Roads and Maritime in two stages. Corkery Consulting was engaged URS to design and document the landscape and urban components in Stage 2 of the upgrade, working in collaboration with the road design engineers. An Urban Design Report was prepared by Corkery Consulting to define a set of design principles and illustrate the landscape design concept. The landscape concept was then documented in a set of detailed drawings and specification. each of the six portions of the road corridor. The Planting Strategy emphasizes the use of Cumberland Plain Woodland species, taking account of the variation in growing conditions along the road corridor. Key urban design components of the Bringelly Road Stage 2 upgrade works include a shared path, pedestrian bridge over South Creek, cut/fill batters, retaining walls, fencing, drainage channels and provision for future road widening. 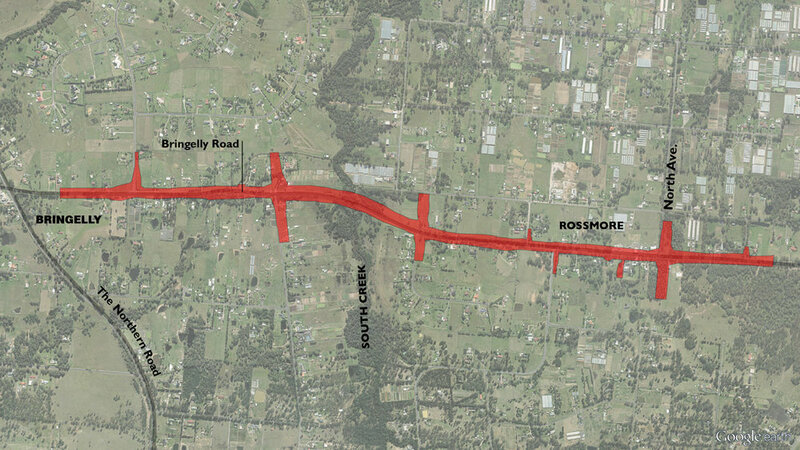 Attention was given to urban design issues at Rossmore Village as well as future urban development that will adjoin the Bringelly Road corridor. The detailed documentation of landscape works prepared by Corkery Consulting includes planting plans, details, planting schedule and specification.